In 30 days time the winners of Euro 2008 will be receiving the Henri Delaunay trophy in the Ernst Happel stadium. Before the whole tournament gets under way, I've been writing a series of posts looking at the official information being made available online by the eight host cities. So far I've looked at three cities in Austria. Salzburg, where I used to live, as well as Klagenfurt and Innsbruck. One curiosity about the organisation of this year's European Championship is the focus on the larger venues for the later stages of the tournament. As neither Switzerland or Austria have a plethora of big stadiums, Vienna will be hosting three group games, and then every subsequent match in the Austrian half of the tournament - which includes two quarter-finals, a semi-final and the final. 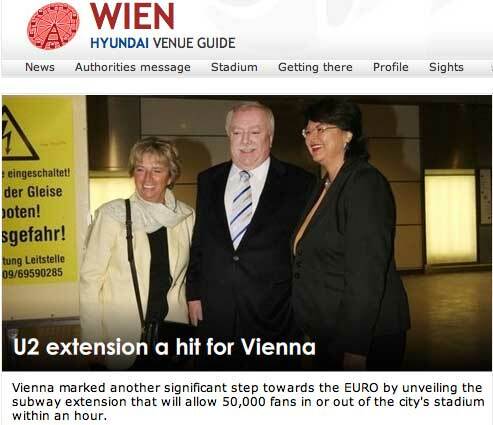 That puts a lot of pressure on Vienna as a host city, and they have responded by re-building their main stadium, and building new transport links to reach it. 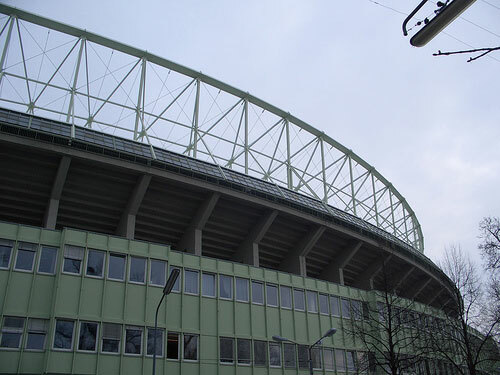 I visited the Happel-Stadium during reconstruction in 2006, when I was travelling around Central and Eastern Europe. It wasn't the most successful of days. I went to the Prater Park, the location of the famous Ferris Wheel featured on Vienna's Euro 2008 logo. That was closed. 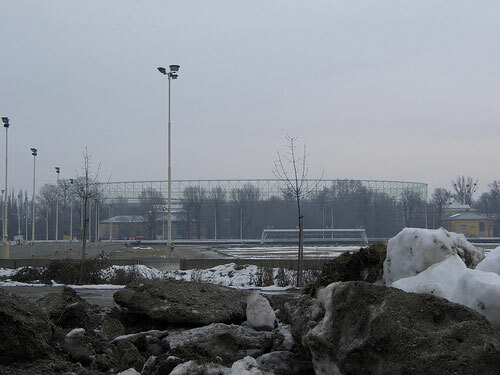 And, because it was the depths of winter, I had a very chilly walk through the deserted park to reach the stadium. I'd also managed, on the Vienna metro map, to miss the small but important note that pointed out that the U2 line wasn't opening until 2008, and so the station I headed for turned out to be a building site, and it was an even longer and colder walk and bus ride back into town. The U2 metro extension is now open, just in time for the tournament. It is capable of ferrying 50,000 fans to or from the stadium in an hour. The regional authorities are very proud of the development, and you can watch a video about the new service online. 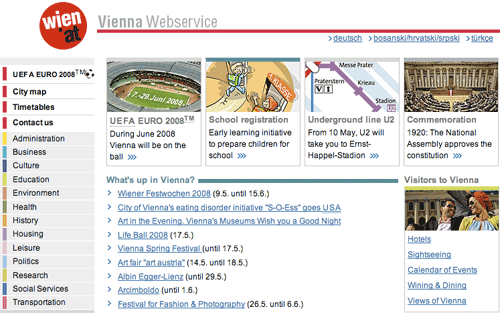 In fact, Vienna's local government have provided a whole multimedia section dedicated to Euro 2008 on their site. The municipal site has Euro 2008 information available in English, German and Turkish, as well as a combined Bosanski / Hrvatski / Srpski version, which I guess back in the day would have been called 'Yugoslavian'. The new U2 metro line also runs by Prater Park, which is where Vienna's 'Fan Zone' will be situated, with giant screens and entertainment for Euro 2008 visitors. The 'Fan Zone' has a dedicated website as well. Not everything about the 'Fan Zone' site impressed me. There were a few rendering problems, and a very odd thing where when you opened the expanded views of the maps, they were barely any larger than the thumbnail image had been. Of the four Austrian venues, I thought Innsbruck had the edge in terms of delivering information about the tournament online, with Klagenfurt's portfolio of sites looking the weakest. By Martin Belam on 30 May 2008.